Winter is an ideal season to plan and build in the kitchen garden as there is little to harvest or plant. Raised beds have gained popularity recently so I thought it would be interesting to take a look at why you might use them and offer a few practical tips. If you find that ‘the ground is a long way down’ and need or prefer to work the soil sitting or standing then you will need to construct walls at least 70cm high and solid enough to take the weight of the soil within them. Add a layer of rubble to allow drainage at the bottom and fill up with prepared top soil. If your aim is close cropping i.e. squeezing more plants into the same space then 20cm walls will suffice but you must dig over the ground beneath, remove perennial weeds and prepare it as you would for planting direct before building. Close cropping only gives a greater total yield if the individual plants have plenty of water and nutrients and this means rooting down into the soil below. If you have poorly drained soil such as unworked clay or a very high water table then raising the soil surface again by 20 or 30cm can provide the rich but not wet conditions that vegetables need. Improve the underlying drainage as well or a period of rain will see raised beds turn into raised bogs surrounded by flooded paths. The idea is not to stand on the soil or compost in the raised beds to avoid compacting it so paths between the beds are vital. Of course you need to be able to reach the centre of the bed to plant and harvest and 3m x 1.2m is about the maximum size, wider and you cannot reach to plant the middle, much longer and the temptation to step over by standing on the boards instead of walking round the bed becomes almost irresistible. One last word of advice: never use old creosoted railway sleepers for a raised bed growing edible crops and check that all timber used has been treated with a suitable non-toxic preservative. 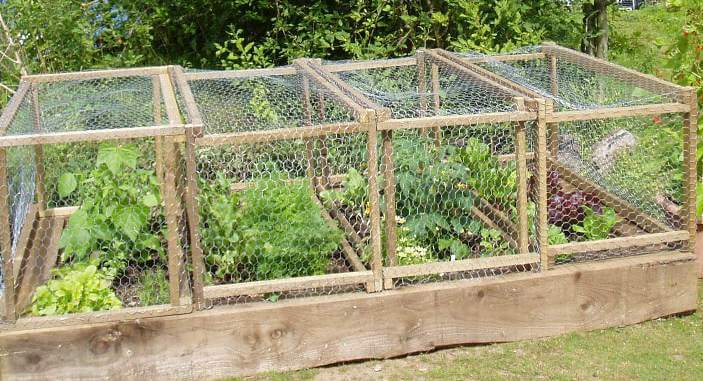 This raised bed also makes it easier to protect the crops from grazing animals including pigeons.